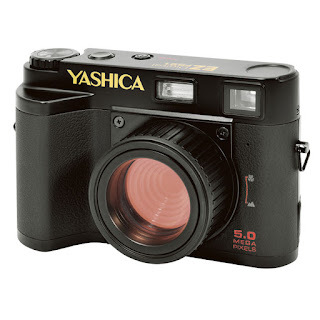 Gas Lounge: Yashica EZ F521 - A new digital rangefinder from Yashica!! Yashica EZ F521 - A new digital rangefinder from Yashica!! Okay, I lied, but it's close enough to get me very excited. 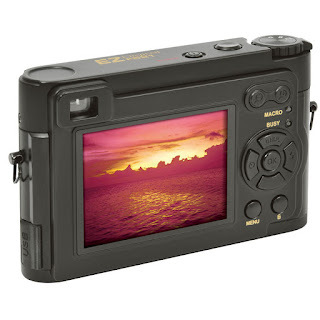 exemode announced a new Yashica branded digital camera EZ F521. It sports a fixed 42.53mm (35mm equivalent) f3.0 lens. That's my favorite focal length, though I wish the lens could be faster. Sensor size is small (1/2.5) but the resolution is a not-overly-aggressive 5 megapixels. The thing I like the most is of course the retro styling. They even kept the Yashica font that gives it the perfect classic feeling. The only problem is that the lens is fixed focused (1.5m to infinity). The EZ F521 will beginning selling in Japan for 7980 yen. Can't ask for much at this price I guess (some Pentax lenses have their prices almost doubled over this past year...). More details at the official site. nice pictures.. im from philippines. check my latest post.. if you dont mind would you like to post your link in my blogs. tnx. godbless you..
"My siblings and I have been hunting for years. We've been looking for some excellent hunting rangefinder and so far, we've come up with our top three: the Nikon 8397 ACULON AL11 , the BushnellG-Force DXARC and the Suaoki Digital Laser Rangefinder Scope. So far, we're still reading a lot of reviews to make sure we get what we want. For more accurate and useful reviews, see: http://opticgearlab.com/rangefinders/best-hunting-rangefinder.html"